Last week I picked up beautiful red and golden beets, roasted them as soon as I came home, and made the svekolnik (cold beet soup) from some of the red ones – the rest were waiting their turn in the refrigerator. This week we got hit head on with a monster heat wave – last night after work I walked out into the parking lot and the asphalt was melting, and so was I. Cooking, in this weather? No thanks, a salad for dinner would suffice. 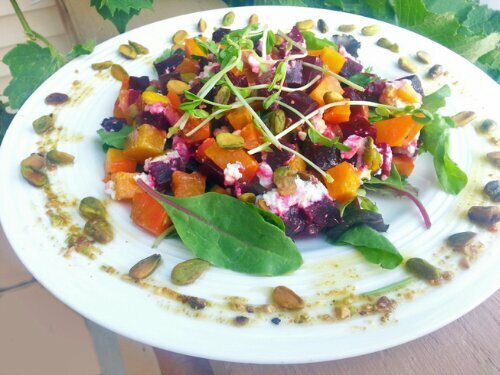 On my way home from work I mentally perused the contents of my refrigerator and pantry for good salad ingredients and came up with a roasted beet, goat cheese salad with pistachio & orange muscat champagne vinaigrette. 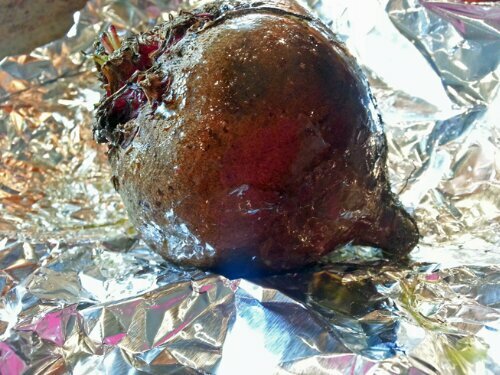 To roast beets: Preheat the oven to 400 F, toss the beets with oil and a little salt, wrap beets in foil individualy and roast for 30- 40 minutes until soft. 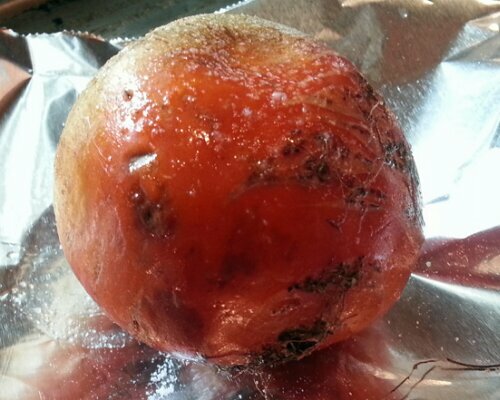 The skin will peel easily once the beets have cooled, can be done up to a few days ahead. Combine the vinegar, pistachios, honey(if using) and shallots in a small bowl. Gradually whisk in the oil. Season to taste with salt and pepper. 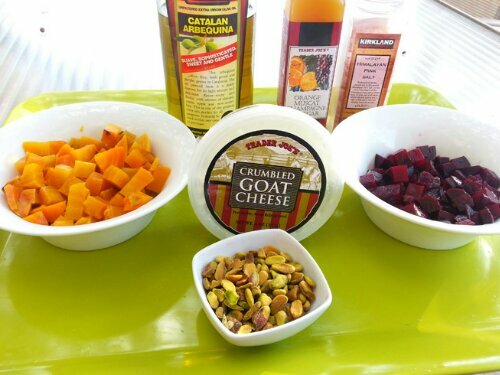 Place red and golden beets in separate bowls and toss with enough dressing to coat. 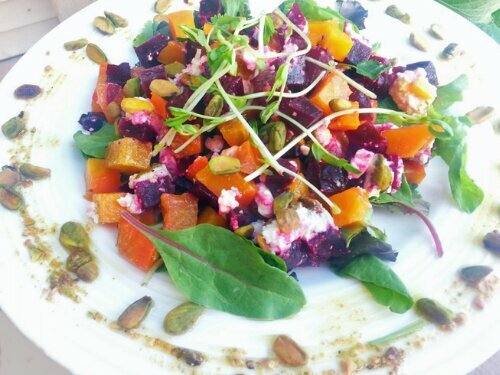 Mound the salad greens atop 4 plates, arange the beets and add goat cheese. Garnish with sprouts and pistachios.